A federal appeals court on Tuesday effectively blocked the trapping and killing of sea lions feasting on salmon at Bonneville Dam. Sea lions may be eating imperiled wild salmon at the dam, but federal authorities now must explain how it's OK to kill a natural predator while allowing human fishermen to inadvertently kill an equal or greater proportion of wild fish. "Obviously, we're disappointed," said Garth Griffin, a federal fisheries biologist overseeing the lethal-removal permit. Griffin said the National Marine Fisheries Service hasn't yet reviewed the 30-page ruling by the 9th U.S. Circuit Court of Appeals. Once it does, the agency then will decide whether to try to address the shortcomings identified by the court ruling and re-issue the permit in time for the next spring salmon run. The ruling comes after members of an advisory board meeting in Portland earlier this month recommended taking even tougher actions against sea lions congregating below the dam. Members of the Pinniped-Fishery Interaction Task Force called for Washington and Oregon game agents to consider shooting nuisance sea lions rather than trapping and euthanizing them by lethal injection. State and federal fishery managers are trying to reduce the amount of wild salmon devoured by sea lions congregating in front of a man-made bottleneck. In 2008, NMFS approved a waiver under the Marine Mammal Protection Act, which allows the states to kill nuisance animals eating wild fish protected by the Endangered Species Act. But animal-rights activists contend the sea lions are being scapegoated for wild salmon driven to the brink of extinction by many decades of overfishing, dams and habitat degradation. The Humane Society of the United States sued to block the lethal-take permit. The organization argued that state and federal fishery managers permit human fishermen an "incidental take" of between 5.5 and 17 percent of wild Columbia River salmon stocks each year without jeopardizing the species' survival. Sea lions, by comparison, have been documented eating as much as 4.2 percent of the combined run of wild and hatchery-raised salmon arriving at the dam. A three-judge appeals court panel ruled Tuesday that failing to explain this discrepancy was arbitrary and capricious under the Administrative Procedures Act. "The agency has not adequately explained its finding that sea lions are having a ‘significant negative impact' on the decline or recovery of listed salmonid populations given early factual findings by NMFS that (fishermen) that cause similar or greater mortality among these populations are not having significant negative impacts," according to the opinion authored by Judge Raymond C. Fisher. Fisher, along with judges Richard A. Paez and Jeremy D. Fogel, effectively overturned a 2008 decision in favor of the fisheries service by U.S. District Judge Michael Mosman in Portland. Mosman had cited a calculation by federal managers that the rate of predation at Bonneville Dam in 2007 could have been as high as 12.6 percent of spring chinook salmon and 22.1 percent of steelhead. Mosman noted that states have curtailed fishing substantially in recent years to protect imperiled wild salmon stocks and that the lethal-take permit was a reasonable measure to address sea lion predation. Even so, the appeals court ruled that NMFS still had to explain why the sea lions' impact on wild fish jeopardizes the survival of the species -- and similar or greater impacts by fishermen and dams do not. 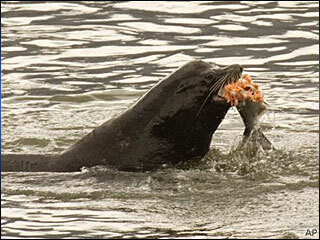 "Sea lions are only one source of salmonid mortality on the Columbia River," Fisher wrote in Tuesday's decision. "Fisheries and federal power system dams are also major contributors to mortality among listed salmonids." Sharon Young, marine issues field director for the Humane Society, said she was heartened that the decision reflected the arguments her organization had been making all along. "It's irresponsible to blame a natural predator that is having much less an impact than the human impact," Young said. At the same time, she acknowledged that sea lions protected by one federal law do have an impact on wild fish protected by another law. "The impact that they're having wouldn't be an issue were the recovery (of salmon) not being suppressed by human causes," she said. The appeals court did leave the door open for federal authorities to manage sea lion predation. "We recognize the challenges NMFS faces in addressing salmonid conservation and recovery in the Columbia River, the efforts it has taken to address multiple sources of mortality and the practical difficulties presented by uncertainties and changing conditions on the ground," Fisher wrote. "We also recognize that sea lion predation is a serious and potentially significant problem in this location."